So June is almost over and my final weigh in for the month was this morning. I forgot to take measurements and will do that tomorrow. Anyway as of today, I am 180.2 pounds!! This is my lowest yet, and I lost 5.8 pounds total in the month of June. 1) The eating plan: No question that the clean eating plan really bumped things into high gear for me. It's taken me years and years to get to this place, but I finally feel like I've kind of reached the point of enjoying nutritious food over really caloric food. The plan ended last week, but I've still carried the recipes/principles into this week and am feeling amazing. 2) I stopped tracking exercise calories: So, I know a lot of people might disagree with this, but I decided to only track my intake this month and not attempt to track my calories burned at all. For starters, I don't wear a FitBit or anything like that, so I really have no way of knowing even a rough estimate of what I burn. And also, when I do make those rough estimates, I feel like I'm giving myself permission to overeat. I decided to just roll with the 1600ish calories a day thing and see what happens, and what I found was that while I'm hungry when meal time comes, I didn't get insanely hungry or feel weak at any point. I feel energetic during my workouts, and finally the scale is moving again. I think when I was "eating back" calories, I was just honestly still eating too much because I was overestimating what I burn. I'm just going to keep rolling with that, but keep things flexible. If I'm shaky or about to gnaw my arm off, then I'll obviously have a little extra. 3) My Powerblock weights: Being able to easily go up on my lifting amounts has been a game changer. I just simply wasn't lifting heavily enough to get the results I wanted before. Steadily bumping my weights ever higher is really amping up the calorie burn for me as well as my muscle definition. I'm already dipping a toe into the 60 pound deadlift world (I started at 20)! 4) I cut way back on drinking. It's really no secret, alcohol has tons of calories, and besides that I make poor food choices when I'm drinking. I tend to throw caution to the wind and eat way more than I should, and also not pay attention to the "I'm full" signals. And y'all know how crazy my stomach is, when I drink it tends to make my stomach feel swollen and crappy. Cutting it out for the most part this month has resulted in my feeling physically SO much better. The few times I have had some wine or beer have just been kinda meh for me. It's made my head hurt and my stomach feel lousy. I've noticed that now when I have a bad day, I'm thinking "God I need to go home and sling some weights around" as opposed to "God I need a glass of wine." Definitely a healthier way of dealing with stress! I just feel really happy. It's been awhile since I felt like I've had my head screwed on 100% when it comes to my weight loss. I've really just been maintaining and dicking around for several months, so it feels pretty wonderful to be losing again and feeling good. I owe a lot of it to my ladies group since we all decided to reboot for the summer and issue some nutrition and workout challenges to each other. It's been so motivating and encouraging having us all in it together. We all do different workouts and eat different stuff, but the core values are the same. Everyone had a great month of weight loss and I am so proud of all of them! Before we talk about the "guns", can I just tell you how stupid excited I was to be able to pull my hair up into a ponytail this morning? (We will ignore the fact that roughly 50 bobby pins are holding the rest of it up). I want to make an effort to not just throw my hair into a ponytail all the time now that I've finally gotten it healthy, but it's nice to do it before a workout since I hate it being in my face! 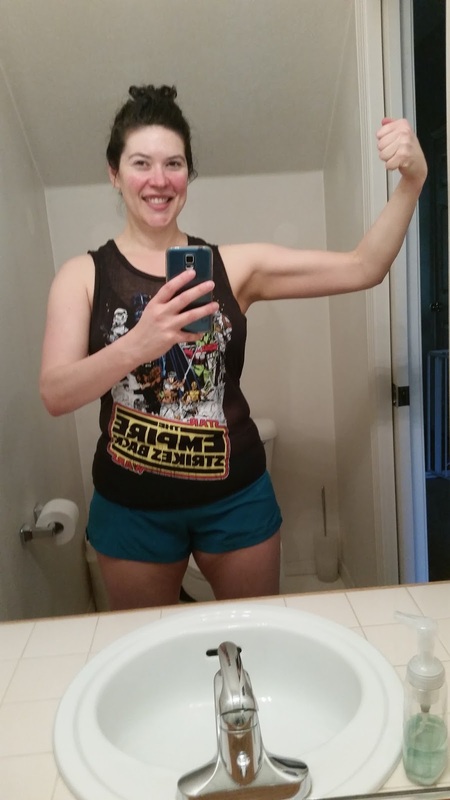 Anyway, I am so happy about my arms. I mean I'm happy about all the progress I've made, but my upper body is something I've really worked hard at the last couple of months, so I'm definitely pretty proud. I make Eric touch my biceps and watch me flex all of the time, because I'm obnoxious. So what's next? I was initially up in the air of what my fitness focus will be in July, but after some hemming and hawing I decided to just restart FB Mass. I enjoyed it so much this time around that I decided to keep rolling with what was making me happy. I did hesitate because I didn't want to get bored, but whenever I thought about starting one of their more cardio/HIIT based videos, I just didn't feel very enthusiastic. I decided that if I'm enjoying primarily lifting, then that's what I need to keep doing. I really like having those mini goals for the amount of weight I'm lifting, and hitting them is very motivating! As far as eating goes, I'm not restarting the FB meal plan per say, but I decided to continuing to eat clean (God, I need to come up with a less pretentious way of saying that). I feel really good eating this way, and I have a lot of things down to a science at this point when it comes to meals and snacks, so it's pretty much a no brainer to keep it up. We have a long vacation coming up for the 4th of July, basically we're fireworks fugitives. Since Molly goes so insane over them, we booked a place out in Bend, OR in the hopes of being somewhere more remote and not having to deal with a hysterical dog. I really hope it's quiet there! It should be really beautiful at the very least. I think one of my biggest downfalls (that I am finally not doing anymore) Is justifying overeating with the activity I did. Oh I can have ALL THE PANCAKES because I ran a 5k LOL Nope. You are killing it and I am loving it! I rarely eat back my exercise calories either even though I do burn some crazy amounts during tennis, I just try to stick with 1500-1700 cal and that's that. Plus I've been really, really working on portion control and stopping when I'm full. Dammmmnnnn look at that gun show! You look fantastic and I am so proud of all the progress that you've made! You have had a wonderful June! So glad we got to talk about your arms because WOW! You have inspired me. Weights this month. Can you send a good recommendation for a beginner, hates weights but knows she should do them workout?